This show-stopping vegan baklava is sure to satisfy any sweet tooth. Layers of crispy phyllo dough are packed with pistachios and walnuts, and drizzled with a sticky sweet syrup. And the whole thing comes together in just one hour! In a large bowl, mix all of the filling ingredients. Set aside. Spray the bottom of a 9x13 baking dish with olive oil. Lay one sheet of phyllo dough on the bottom of the baking dish. Spray lightly with olive oil. Top with another sheet of phyllo dough. Spray with olive oil. Repeat until you have layered 5 pieces of phyllo dough. Spread a thin layer of the nut mixture on top of the phyllo dough. Top with another five sheets of phyllo dough – spraying each with olive oil in between layers. Repeat until you have used all the nut mixture, reserving five sheets of phyllo for the top. Cover the top layer of nuts with the final five sheets of phyllo dough. 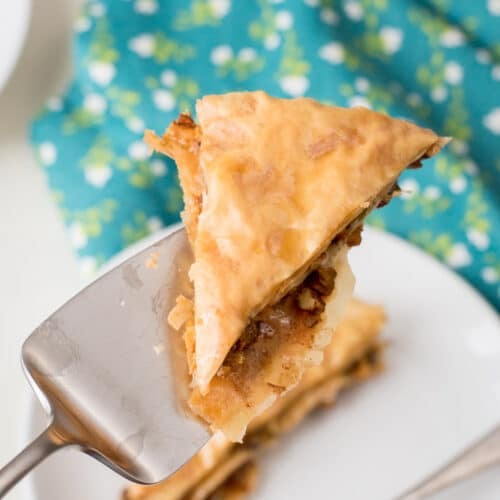 Use a sharp knife to cut the baklava into squares or triangles. Once it is baked, the crust will be too difficult to cut! Bake for approximately 35-45 minutes, until the top begins to brown. While the baklava is baking, prepare the syrup. In a small saucepan, combine all of the syrup ingredients and bring to a boil over medium heat. Reduce heat and simmer for 5-10 minutes, until a thick syrup is formed. Remove the cinnamon stick and set syrup aside to cool. Cool for 3-4 hours before serving at room temperature.